Ian: Where can I get a cool lab coat like the one I saw at Anchor? Bob: Thanks for the compliment! I always feel much cooler when I put on the lab coat. Smarter too. 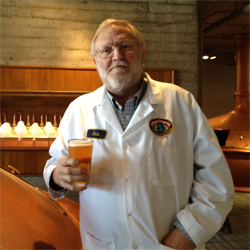 It’s just a standard lab coat, but it’s the guy who’s wearing it and the Anchor patch that makes it truly cool. We get the lab coats from a uniform service and have them sew our patches on. You can get an Anchor patch from us at our online Steam Gear store, and you too can be cool. Mike : Why don’t you ship Anchor brews to Australia? Bob: Anchor is now available in Australia! Please contact our distributor Robert Oatley Vineyards for more information on where to find our craft beers. Brenner: Any chance that Anchor could host homebrewing classes? Bob: While Anchor fully supports the homebrewing community, we’re not really set up for conducting homebrewing classes on-site. Commercial brewing on our scale is so much different from homebrewing, that it would be difficult to model specific techniques or draw useful comparisons. I recommend that you join a homebrewing club and seek the advice of their members. These clubs are very good, as well as supportive and experienced in the craft. Check online with the AHA (American Homebrewers Association) for a club in your area. They are always looking for new members. I met Bob, and had the pleasure of working with him for one day. He made my usual sales route into a new and interesting journy into the world of beer. With each stop I learned something new about craft beers, the industry, the laws, and the lingo. I must say that I learned more from him in one day than I had learned in the first few months in my new job. The more he talked the more the more things started to click for me. Suddenly all the lingo I had heard around the office, and had been to embarrased to ask what it all meant, was being explained to me. He opened my eyes to what real passion for beer is. Bob cares about beer, but more importantly he cares about people and how they experience beer. Anchor is lucky to have such a talented gentile giant working for them, and anyone who has the pleasure of meeting him is lucky to have the chance to learn from, in my opinion, one of the founding fathers of craft beer.